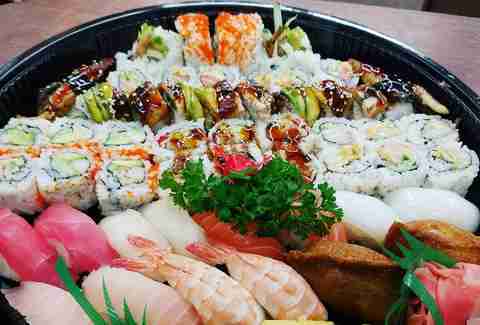 When that sushi craving hits, it can be easy to rely on your go-to neighborhood take-out spot. Hey, we get it, nothing wrong with a little fake crab from time to time, but if you're seeking the best rolls our city has on offer you'll have to break from your bubble. 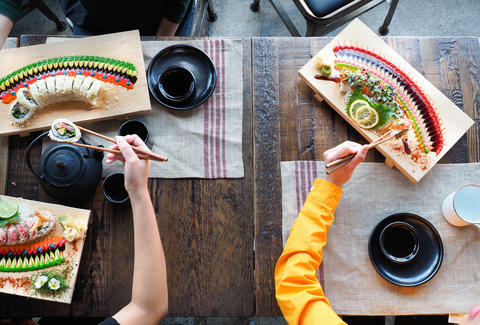 From affordable BYOB spots, to upscale restaurants that make you feel like you’re in Tokyo, here are 12 of the best sushi restaurants in Chicago. After recouping from a recent fire, Arami is back in business serving fine sashimi, nigiri, and maki, as well as tasty ramen, and other large and small plates. 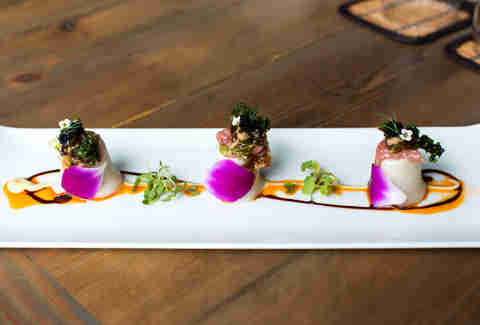 Presentation is not an afterthought here; each dish is beautifully plated. They recently received a Michelin Bib Gourmand nomination for the fifth year in a row. Juno frequently ranks on top sushi joint lists because of its sleek decor, fish quality, and excellent staff, including sushi chef BK Park. You can opt for an a la carte meal, or splurge on the omakase (chef’s choice) menu for $150 per guest (and an additional $75 for wine pairings). Humboldt Park’s Kai Zan is another spot where it’s best to order the omakase menu and trust the sushi chef. This is one of the best places to order uni (sea urchin) which is flown in fresh. Be sure to snag a wooden booth which is designed for ultimate privacy during your meal. You’ve probably seen a tray or two of sushi from Lawrence Fish Market on your Instagram feed. The takeout-only and cash-only spot offers affordable sushi every day of the week. Sure, the fish may not be of the same caliber as what you’d find at other restaurants on this list, but if you’re looking for a lot of sushi that won’t set you back a ton of money, Lawrence Fish Market is your place. Macku Sushi can satisfy your need for a standard spicy salmon roll, but if you want something more adventurous, try the omakase menu. Chef Macku gets very creative not only with his presentations, but also flavor combinations, such as a spoonful of salmon roe with Pop Rocks. Hopefully you won't befall the same fate as Little Mikey from the Life commercials. Step foot into Boka Restaurant Group’s Momotaro and you’ll be instantly transported to Tokyo. No aesthetic detail is overlooked, and that same level of detail is translated into each dish on the menu. 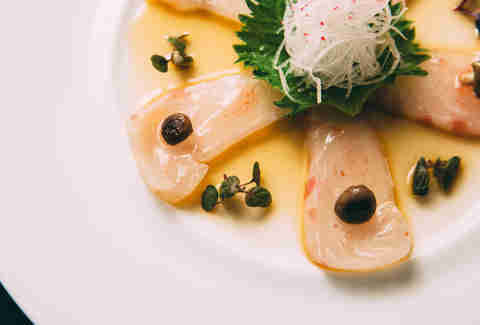 While Momotaro’s menu is quite broad, its sushi selection is worth focusing your attention on. You can order pieces a la carte, including seasonal nigiri and sashimi, but try the sushi omakase with a selection of chef’s choice nigiri. Each piece is clean, fresh, and simple without heavy-handed aiolis. 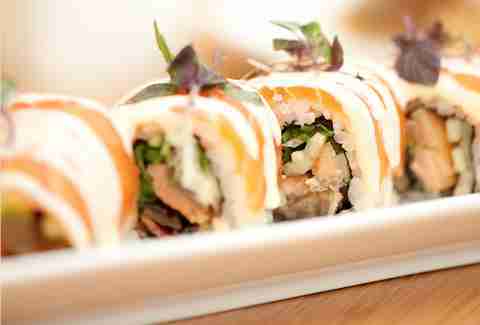 Lettuce Entertain You’s Naoki Sushi is a hidden gem, literally. The intimate restaurant is located behind Intro’s dining room and kitchen. Grab a seat at the sushi bar to interact with Chef Naoki Nakashima while he prepares sashimi plates, hand rolls, and maki including hamachi with yuzu, scallion, and cucumber. 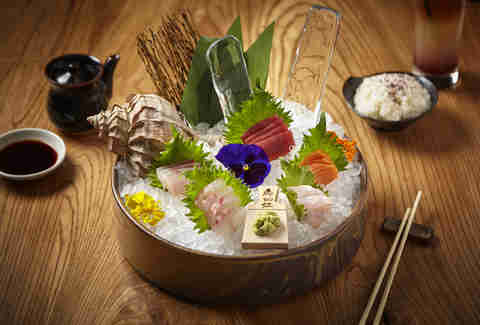 The Chicago outpost of Roka Akor features a contemporary dining room serving intricate preparations of fresh fish. 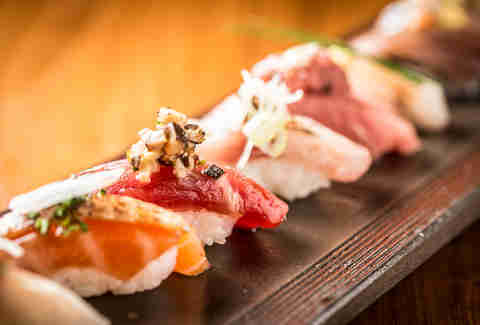 You can choose from two omakase options, Signature or Decadent, or order a la carte. Sashimi and nigiri platters are works of colorful art, each piece placed carefully on ice-filled bowls adorned with floral garnishes. Four-time Michelin Bib Gourmand winner Sushi Dokku is located in the heart of West Loop’s restaurant row. 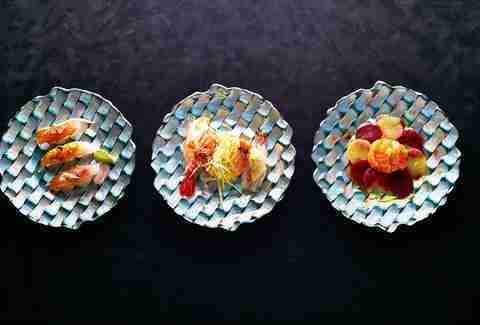 The menu features a large selection of standard nigiri and sashimi, as well as chef-driven nigiri, such as the South Pacific sea bream with smoked tomato and black sea salt. After dinner, head downstairs to Booze Box for a sake-based cocktail. 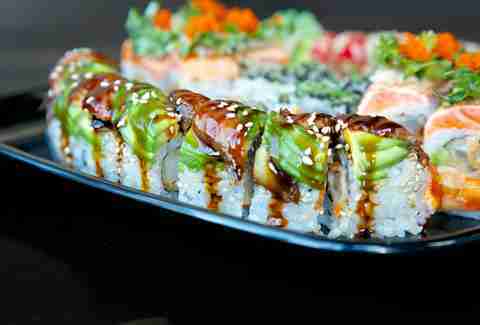 Grab a seat at the West Loop or Andersonville location of Tanoshii, otherwise known as Sushi Mike’s. Chef Mike Ham prides himself on crafting sushi based on each customer’s taste preferences. 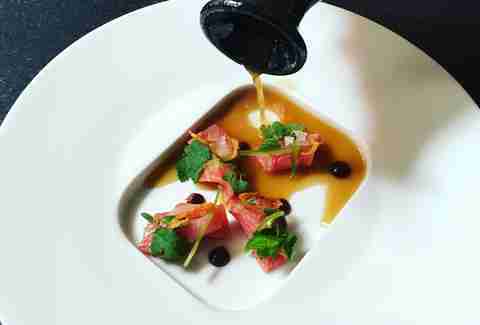 Many opt for his omakase menu, as well as the fish and chips tuna tartare starter. Take your patience and a six pack of Sapporo to Toro Sushi in Lincoln Park. The small BYOB sushi spot frequently has a line waiting outside, and for good reason. Toro is not your typical Clark St sushi spot. 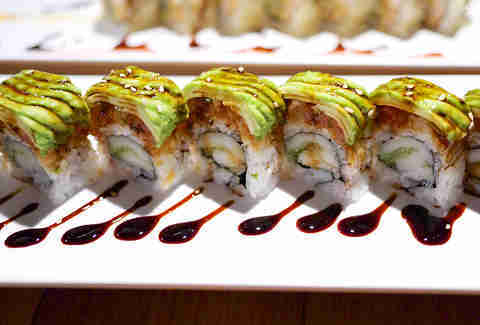 Specialty and maki rolls are well-packed, such as the Miami roll with unagi, spicy tuna, mango, avocado, and unagi sauce. Owner and Chef Mitch makes everyone feel welcome and prepares consistently fresh food. BYOB Yuzu Sushi & Robata Grill is known for its colorful sushi presentations, as well as its equally colorful sushi roll names, like the #ThugLife2 roll with salmon, jalapeño, avocado, cucumber, and cilantro. 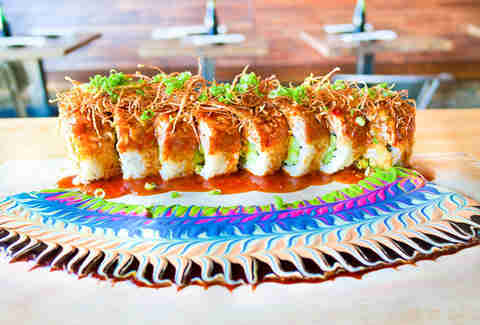 Every sushi order is a work of art with chefs using colorful sauces in an array of patterns and shapes. Amanda Topper is a contributing writer for Thrillist Chicago, foodservice industry analyst, and food blogger for TheGhostGuest.com. Donuts are her favorite food group. Follow her at @AmandaTopper.